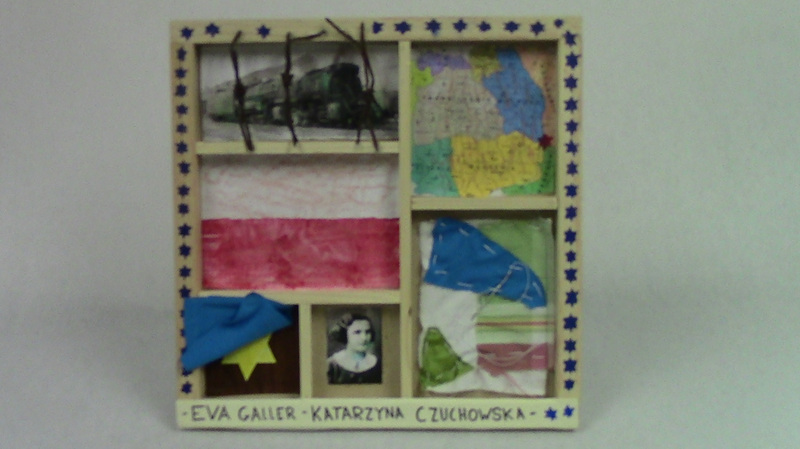 This shadow box represents the life of Eva Galler, a holocaust survivor. The top left triangle represents her near death experience on a train heading to a concentration camp. Eva was on the train when a young boy ripped the barbed wire around the window, which is represented by the barbed wire in front of the train. She jumped out of the window and was able to escape. Below that is a Polish flag because she was born in Poland. There is also a Star of David hidden, which represents the fact that she had to hide her Jewish identity. To the right is a picture of Eva and to the right of that is fabric representing her work at a blouse factory later in her life. Lastly there is a map of Poland with a Star of David on Oleszyce, where she was born. “Run, run--maybe you will stay alive.” These were the last words Eva Galler heard from her father as she and her brother and sister jumped out of the cattle train heading to a concentration camp. A young boy on the train ripped the barbed wire allowing them to escape. As Eva and her siblings leaped out of the window, bullets whizzed right by her head as she landed in a snowbank next to the track. After the train passed she stood up and found her sister and brother dead. This was just the start of Eva's journey. Eva Galler was born in Oleszyce, Poland in 1924. This small town consisted of about 7,000 people, half of whom were Jewish. One night in June, everyone woke up to the roars of motorcycles and gunshots. They looked outside and found German soldiers shooting left and right. From then on Jews weren't permitted to keep a job, and potatoes became more valuable than money. The German soldiers appointed a Judenrat which is a Jewish council. One day the whole town was ordered to the city square. The soldiers burned the whole inventory of the local synagogue in front of the whole town. This was how Jews were treated in the small town of Oleszyce. One day in September 1942, everyone had to take their belongings and walk five miles to a nearby ghetto in Lubaczow. In the ghetto it was thirty people per room with only five beds, so they had to sleep like sardines. After months in these awful living conditions, they left once again and were sent to a camp called Belzec. At this point there was little hope of survival for Eva and her family. They were loaded on to a cattle train with nearly eighty people in the car. During their journey a little boy on the train ripped the barbed wire in front of the window. This would be the perfect escape route if it weren't for the soldiers on top of the train with loaded guns. That’s when Eva’s dad encouraged her to jump. Her heart was pumping as she approached the window. Right before Eva jumped her father said, “I know you will stay alive. You have the Belzer Rebbe's blessing.” When Eva got up to find her sister and brother dead she took off her yellow star necklace and promised herself to never wear it again. Eva knew she had to go on, so she ran back to Oleszyce. Eva found a family friend who hid her for a few days but soon made her leave because it was too dangerous. Eva then found another family who housed her for one night. Eva’s final plan was to go to a nearby train station. She paid for a ticket to Cracow with the money one of the families gave her. In Cracow boys and girls were caught and sent to work in Germany. Luckily they didn't know Eva was Jewish, so she went along with the kids. All the kids were inspected by doctors and, that’s when Eva came up with a Polish name, Katarzyna Czuchowska. For the next year Eva worked on a farm in Germany. All she wanted to do was go back to Poland. As the war was coming to an end, a list of people who died in Oleszyce came out. Out of 3,000 Jews only twelve survived, one of which was Eva. She also found someone who she went to school with named Henry. Eva and Henry got in touch and eventually got married. In 1954 Eva and Henry moved to New York, after living in Sweden for eight years. Eva is now 87 and lives in New Orleans. After years of not being able to speak on this gloomy subject, Eva’s kids finally convinced her to share her story. Eva and Henry now share their story with the world and their three daughters. “And that’s how life goes on.”- Eva Galler.